Okay, fine, you convinced me. A playhouse will go under the stairs. Hopefully. Maybe. Depending on the additional cost. We hadn't budgeted for drywalling under the stairs (it was going to be rough storage) so now its a matter of how much it will cost to get this little slice of toddler heaven built. We're hoping we can offset this cost with things that were in our basement quote but won't be done (some were deemed unnecessary, some aren't possible). HandyMan and I really could do it ourselves, but since our contractor Basement Spaces will be doing the framing and drywall, it only makes sense to add this small project to the job. And that my friends is scope creep. I think its inevitable to have a bit of scope creep no matter what renovation you're doing. "While we have the walls open we might as well..." is a common phrase around our house. Electrician coming on site? Well, we might as well have him do this and this and this while he's here. so exciting!! can't wait to see the final product!! Have you thought about finishing the playhouse with beadboard - it looks adorable and is really inexpensive and easy to install. That would save you a bit of money as you could do it yourself. I thought that too, but it looks like we might have enough storage in other parts of the basement to be able to give this space up for fun. Converting it shouldn't be too difficult too - just switch out the half-height doors for full height ones. Definitely something to consider though! So true! I remember our space under the stairs being lots of fun but a little bit creepy too. PS. Jen, we call it "mission creep" around here - glad to hear I'm not alone! I'm going to go against the grain here, and vote "Storage" (SORRY!!!!). Playspaces are really cute and really great...for a few years, until the little one either gets physically too large to fit, or just loses interest. Then, you are stuck spending more money to convert the space back to something useable. I would use the space under the stairs for storage, and then build a standalone play "something"- cafe, grocery store counter, whatever- for the little one to use. Is the Space large enough to place Her Kitchen unit that You Guys built? As I was "thinking", that You could turn the "Area" into a little "CAFE" for Her... Put a roller-blind "awning" [maybe with hinged "poles" so that it can be set back flush with outer wall when not in use], get a little *round* Table & Chair -[did Loblaw have any child-size patio furniture? ]- that can be set just outside where She can serve stuff... Toss in some gingham curtains, that little planter... When She's done, the Table Set can be shoved into the Space and all be closed up with any old set of Shutters to give that "Bistro" look..? She could go totally *DORA* "Marseilles" on it!! ;-D -- I see Nautical Stripes, Berets, and Vuarnets in Her Future! This is so sweet. When I was a kid, we got the furnace room to ourselves where we played "school", or "restaurant", and we would set up scary Hallowe'en scenes. It's always good to have a designated kid zone where the imagination is free to...imagine! 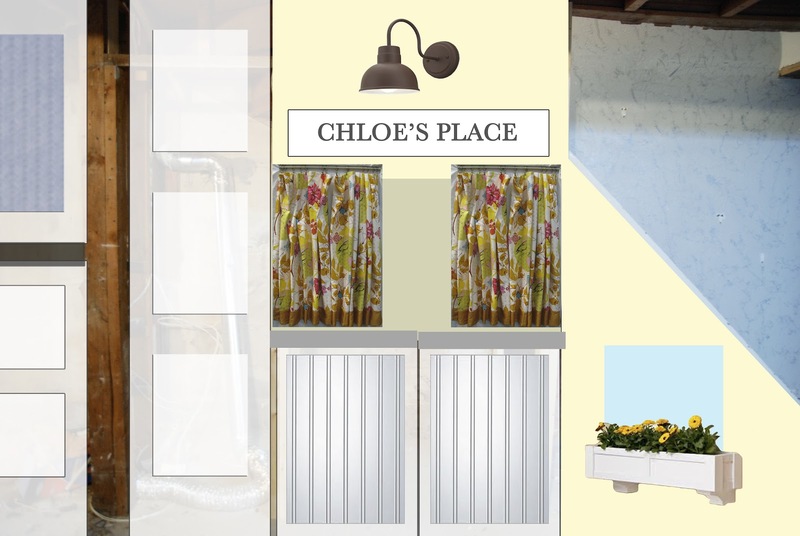 Chloe's Place - has such a nice ring to it! How fun! The funny thing about kids it they don't care if it is drywalled and all cute. We had a 4 level split when we lived in Alberta and one section created a small crawl space that was NOT finished but had a little door that connected it to the playroom. My kids LOVED playing in the space under the stairs. They dragged in a carpet remnants, dished, stuffies, etc to make it their own! Thanks! I was looking at a very similar light to the bottom one at Home Depot, but it only came in polished nickel, and I need something black. We''ve got basically a whole new house, at this point--three new bathrooms, a new kitchen, and major updates/upgrades to just about every other room. As I'm sure you know, it gets to be less fun when it's been going on for so long (since last July). I just want to live in the house! Yay!!! So excited or this project. It's going to be awesome Jennifer. Love the dutch-style doors and cafe curtains. Can't wait for your next post. Fantastic! Can't wait to see what you come up with and image all the fun she will have and the places she will go in that little space. Yay! I was hoping you'd go with the playhouse. This is going to be such a fun project to watch unfold! Adorable! 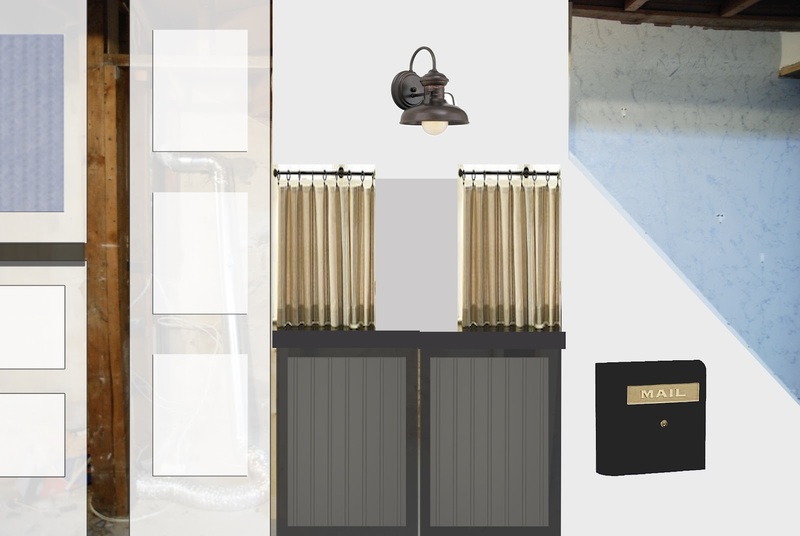 Where are the light fixtures and the mailbox from? Those are both high on my list of "things still to choose for the house"--the decision-making is basically done for the interior (new kitchen next week! ), so now I get to focus on the exterior.